03/22/2019 First Female Ruby-throated Hummingbirds Observed! First Female Ruby-throated Hummingbirds Observed! The migration is pushing northward as far as the Ohio River. First female Ruby-throated Hummingbirds starting to arrive in Gulf Coast states. Most first sightings of hummingbirds are males. Male hummingbirds arrive first so they can find and defend a choice territory for luring females. 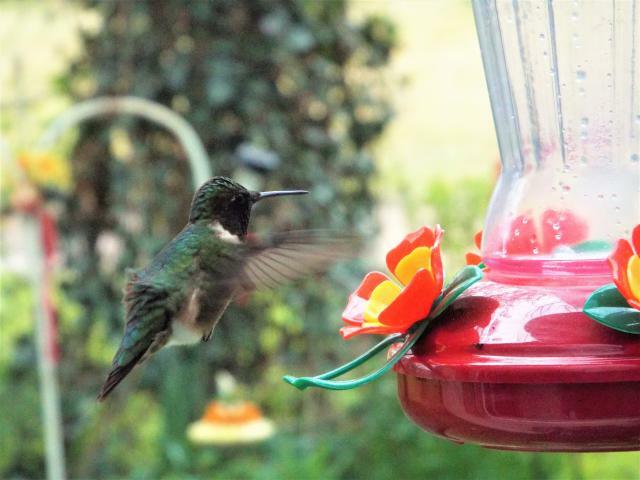 Indeed, there are many more sightings this week for male Ruby-throated Hummingbirds from Journey North citizen scientists who live along the Gulf Coast states. Usually female Ruby-throated Hummingbirds arrive a week to 10 days later. There was a cluster of sightings of Black-chinned hummingbirds reported in Texas. Several Journey North citizen scientists recorded Rufous Hummingbirds along the west coast and into the Canadian province of British Columbia.